Many fans found those comments over the top, and so did Americana MMA. The apparel brand was so offended by Rousey’s remarks that they questioned the UFC’s Code of Conduct and called for a suspension. Since the suspension is unlikely to happen at this point, Americana is reaching for their checkbook. Their disdain for the champ led Peter Giannoulis, owner of Americana, to make an offer of $5000 to anyone who knocks out Rousey. That starts with Rousey’s next challenger, Alexis Davis. Taking a look at Americana’s Facebook page, it seems they’ve received both praise and scorn from fans. 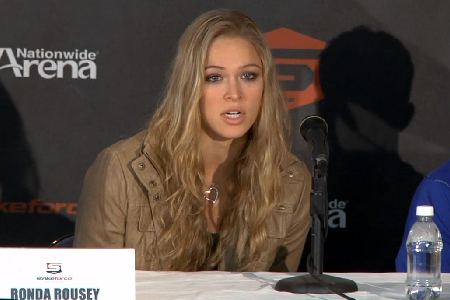 I have to say, I’m not sure I completely understand the derision—unless they’re just Rousey fans trying to defend her. Some comments seem to be attacking Americana for “placing a bounty” and glorifying “beating a woman.” Of course those are ridiculous parallels. Giannoulis shockingly had to clarify that he would NOT pay the reward to vigilantes and thugs who might want to jump Ronda outside her home. To the people who suggested that, please get a life. As for the bounty? Yes, it’s a bounty. The exact same type of bounty the UFC rewards EVERY event. Ever heard of Knockout of the Night? Americana isn’t the first to do this either. In fact, the recent inundation with new sponsor Dynamic Fastener brought the spotlight on owner/president Kevin Perz, who also has a dislike for Ronda. The “bounty” he offered Miesha Tate is double the Americana reward. That’s 10 grand for beating Rousey. As outspoken as Rousey can be—and her lack of political correctness—it can’t be a surprise that these type of reaction are coming forth. To her credit, no one has been able to cash in on these incentives yet. But as always happens in MMA, someday somebody will. And Americana and others will gladly pay the premium to see their least favorite fighter get beat.